Hi! I'm Nate Wood, owner of Stahman Guitars. Want to learn more about what I do, and how I got here, via audio? Check out the Fretboard Journal Podcast I was on by clicking the Fretboard Journal logo below, or click right HERE. It's been an absolutely crazy ride! ​I've been homeless for guitars. I've been broke for guitars. I've been emotionally tormented for guitars. But I'm still here, and I plan on sticking around. ​The path that brought me here started in Utah, where I played in a couple of bands- writing songs, partying, and having the time of my life. Having the time of my life was taking a toll on me though, and I knew it. I opted to make a change and pursue a career as a guitar maker. I moved to Phoenix, Arizona and attended the Roberto-Venn School of Lutherie in January 2011. 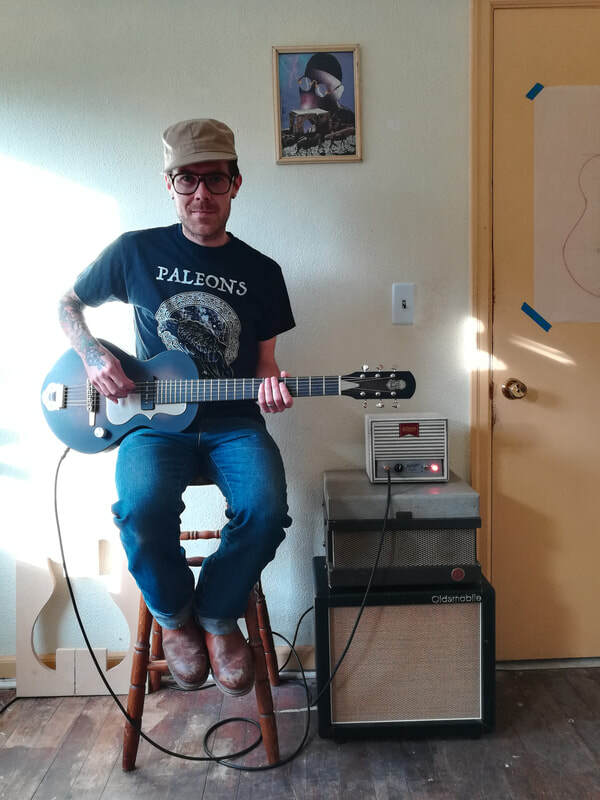 ​Upon returning to my homeland in Utah, I was able to get an apprenticeship with the badass guitar maker Ryan Thorell. During my 2.5 years working with Ryan, I honed my skills working on archtop guitars, flattop guitars, and various other projects. We even built a multi-scale electric guitar for one client! Ryan was kind enough to allow me to finish a few of my own instruments while working with him. I could never thank him enough for the knowledge and experience gained in his shop. Today, Ryan is still a constant source of ideas, motivation, and friendship. ​For an article about Ryan's work during the time I apprenticed with him (they even used my name! ), check out Premier Guitar by clicking the logo below, or clicking HERE. In 2014, I packed everything I had into an old van and trailer. I drove away from the place I grew up, heading to the Northwest, with no real idea what I was doing. All I knew was that I wanted to continue my career in luthiery, and I needed to keep progressing. I felt like forcing myself out of my comfort zone might help me along the path. Once I arrived in Portland, it was apparent that things would be more difficult than I'd planned. The trailer I planned to live in had begun to collapse, and the person who'd promised me a place to park it backed out. Before I knew it, living in my van had become a necessity. It was uncomfortable, embarrassing, and frustrating. ​Through luck and effort, I eventually got some work through various guitar stores in Portland. I was also able to rent a shared work space just up the street from Old Town Music. Thanks to the people in the shared work space and the employees at Old Town Music, I was able to eventually get into a house. ​My living situation changed a few times while in Portland, but I was never again homeless. Working at Old Town Music, the shared workspace, and occasionally Twelfth Fret Guitar Repair, I became a skilled repairman. Refrets, brace repair, neck resets, electronics rewiring, and the construction of my own guitars filled my days for nearly three years in Portland. I also got to work for some amazing musicians (Portugal. The Man, Jesse Dayton, Mac DeMarco, Emma Ruth Rundle, Yeasayer, and others). In 2017, I picked up my stuff and moved again. ​This time, the move was different. It was intentional and well-planned. ​My fiancé (update: we're married now!) and I bought a house here in Springfield, and I began to meet local musicians. Through a little networking, I began taking on more frequent repair work. I've built a few guitars since I arrived, but things have picked up enough on the repair side of my business that it became necessary to expand. I'm excited to announce that the new Stahman Guitars storefront is now open at 325 Main Street in Springfield, Oregon. Come say hello!